This entry was posted in Books, Events, history, vampires, Writing and tagged Billy the Kid, Clockwork Legion, croquet, old west, Owl Riders, Pat Garrett, photograph, Steampunk, Straight Outta Tombstone, Tom O'Folliard, vampires. Maybe another way to put it is that my Billy is definitely not Billy the Kid but he could have been. My Billy’s life changed course before he became “the Kid” of myth and legend. Make no mistake, my Billy is still a dangerous character, but he’s been shaped by fighting in a war that never happened in the Kid’s reality plus he learned discipline from an exiled samurai he respected. By the time I got to Owl Riders, my Billy is a very different person than the Kid of history. To me, that’s part of the fun of historical fiction, changing events and then seeing what impact it has on people. Some people are well defined and may not change a lot. But for a guy like Billy who was still a teen at the time of Owl Dance, it might change the whole course of his life. I also say he “may or may not be the Billy the Kid” of history with my tongue firmly in my cheek. Part of that is because so many people are very passionate about who the Kid was, even though very little is known definitively about him, including his real name. My Billy is William Henry McCarty and some sources will say that’s likely the Kid’s real name, but there are historians of various stripes who will disagree. My Billy is William Henry McCarty. If the real Kid wasn’t William Henry McCarty, then my Billy ain’t him — but rather an alternate universe version who had a different name and followed very closely in the Kid’s footsteps until the paths diverged. Thanks for dropping by, Jack, and giving me a chance to elaborate on my comment. Also looking forward to the day when Stingaree sees the light of day! Well, it sure looks like him compared to the other tin type. But that’s just my opinion. In that sense, I agree. 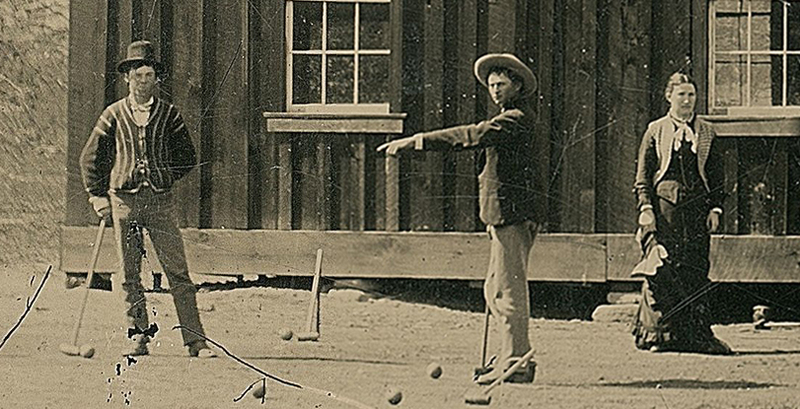 I think the guy in the croquet photo looks like Billy the Kid. So far none of the arguments against it being him have convinced me it’s not him.